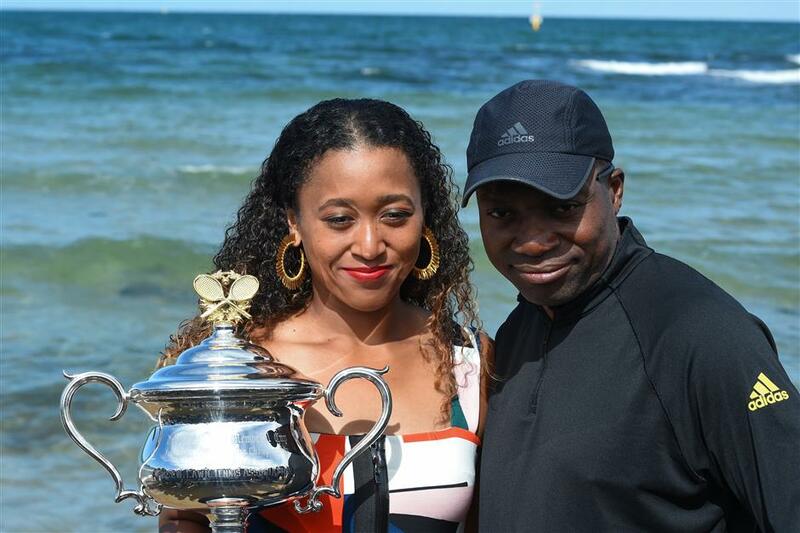 Japan's Naomi Osaka and her father Leonard Francois pose with the championship trophy at the Brighton Beach in Melbourne on Sunday, a day after her victory over Czech Petra Kvitova in the women's singles final of the Australian Open. Newly-minted Australian Open champion Naomi Osaka said on Sunday she was not satisfied with back-to-back majors and hoped to complete a "Naomi Slam" after her success at Melbourne Park. Japan's Osaka becomes the first Asian to hold the top ranking after downing Czech Petra Kvitova in a tight final on Saturday night and adding the Australian crown to the US Open title she won last year. While her maiden Grand Slam was marred by losing finalist Serena Williams' umpire-baiting histrionics and boos from the Flushing Meadows crowd in New York, Osaka was allowing her follow-up success in Melbourne to soak in. Osaka became the first woman to win successive majors since Williams in 2015 and the youngest since Martina Hingis in 1998. Williams went on to complete her second "Serena Slam" — holding all four majors in the same 12 month period — and Osaka was excited about the prospect of claiming the French Open and Wimbledon for a "Naomi Slam". Osaka was unfazed by the attention she was receiving, saying she was in the spotlight even when her ranking was languishing in the 70's.